Click on the image for more photos of the installation at SOFA and more photos of the artist. Following our extremly successful inaugural exhibition in 2003 of the ceramic work of Katô Yasukage , Joan B. Mirviss Ltd. is especially delighted to present his second solo exhibition in America - this time at SOFA New York. One of the top young ceramic talents in Japan, Katô Yasukage specializes in the centuries-old traditions of milky white, red and gray shino ware and the celebrated copper green oribe glaze into which he continues to infuse new energy. Critics confronting Kato's many major exhibitions in Japan continue to marvel at his wide range of forms and refined sense of stability, as well as the nuanced variations in his palette using centuries-old glazing and firing techniques. Coupled with his emphasis on sculptural sensibilities, and balanced by his textural focus on the bold, faceted surfaces of each vessel, the impact created in this work is simultaneously visual and tactile, powerful yet tranquil. 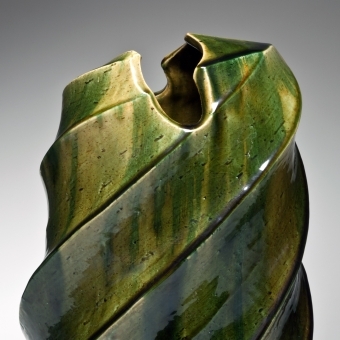 The fourteenth-generation ceramic artist in his family, Katô Yasukage (b. 1964) is descended from Katô Kagenobu, the sixteenth century creator of the celebrated Motoyashiki kiln (mufti-chambered climbing type of kiln). However, due to the untimely deaths of his father and grandfather, both master potters, his early study of the art of Bizen-style wood firing was with the National Living Treasure Yamamoto Tôshû. Further training in sculpture at Nagoya University gave him grounding to push beyond the traditional aesthetics of his lofty heritage. His work reveals a remarkable assimilation of traditional aesthetics that he has redefined within a strikingly modern and highly personal oeuvre.